Provisions a new service instance in a domain. 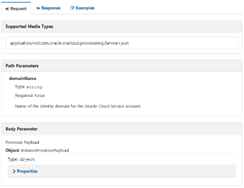 IP networks: A service instance can be attached to an IP network that is already created in Oracle Compute Cloud Service. If you specify an IP network, when you add an instance to an IP network, the instance is assigned an IP address in the IP subnet that you specify. See Creating an IP Network in Using Oracle Compute Cloud Service (IaaS). IP reservations: A consequence of using an IP network is that the auto-assigned IP address could change each time the service instance is started. To assign fixed public IP addresses to a service instance that is attached to an IP network, you can first create reserved IP addresses, then provision the service instance to use those persistent IP addresses. Read the complete article here.